Last week on Thursday I gave a talk to the Boston Azure User Group[†]: a high level introduction to Windows Azure titled Azure 101 (you can download the Azure 101 slide deck). I shared the stage with Mark Eisenberg of Microsoft who walked us through some of the features coming in the November update of Windows Azure. One of the sites Mark showed was the Open Source Windows Azure Companion. Hope to see you next month when Ben Day will talk about how Windows Azure and Silverlight can play nice together. For up to date information on Boston Azure, follow Boston Azure on twitter (@bostonazure), keep an eye on the group’s web site (bostonazure.org), or add yourself to the low-volume email announcement list. [†] Yes, I also founded and run the Boston Azure User Group, but it is my first time having the honors as the main speaker. This entry was posted in Azure, Bill gave a talk, Boston Azure User Group, Cloud Computing on September 26, 2010 by Bill Wilder. Microsoft Windows Azure supports several storage approaches: Blobs, Tables, Queues, Drives, and CDN. We even have SQL Azure available to us for full relational power. 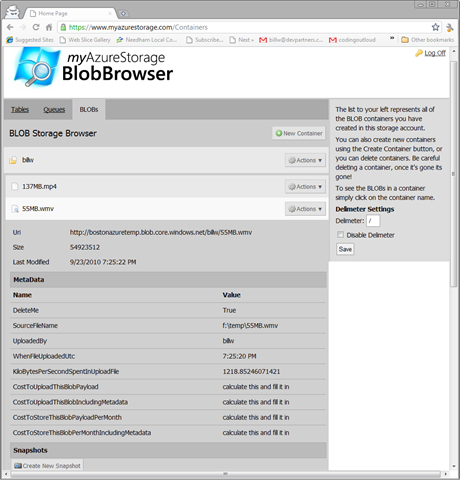 This post will outline some basic thoughts on programming Blob storage in .NET. And at the end there will be one (long) page of example code (though you will need to supply your Database Access Keys for your Azure Cloud Account). 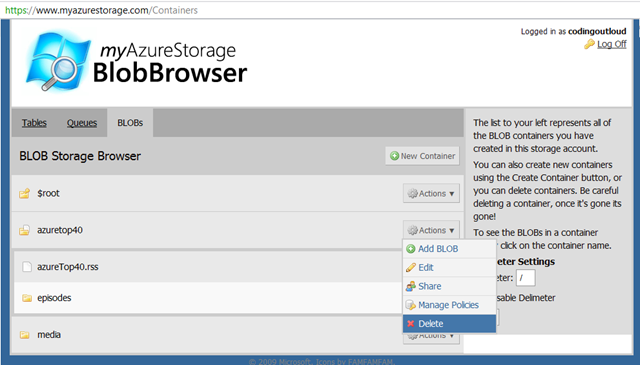 This code is a complete program that will upload a file into Azure Blob Storage and mark it as Publicly Readable, as would be suitable for linking to such resources from a public web site. No, .NET is not needed to program against Blob storage. Any programming language or platform can be used, provided it can support calling out via http. 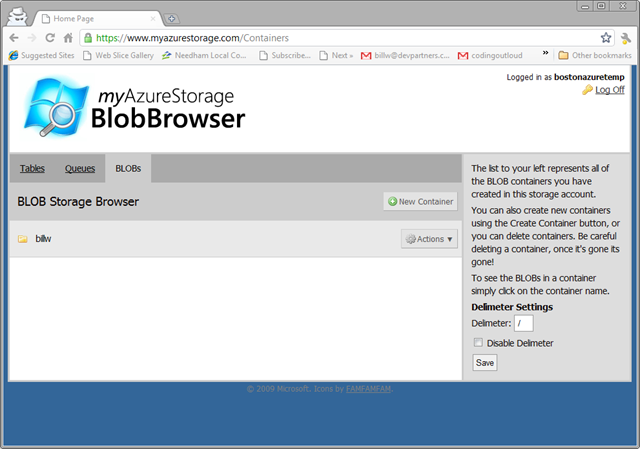 Programs speak to the Blob storage service in Azure via a RESTful interface – yes, good old-fashioned http goodness. Isn’t REST Awkward to Program Against? Well, there are a few details to making these REST requests: construct a well-formed request body, set up the http headers, add your hash (in most cases Azure requires this step as proof you have the right key), create a web connection, send your request, handle the response, and repeat. But in .NET it is even easier due to the Azure SDK where you will find some helper classes, such as CloudBlobContainer, CloudBlobClient, and CloudBlob. These helpful helpers help you help yourself to Blob storage services without having to worry about most of the details – you just deal with some objects. How Do I Access the Azure SDK, and How Many Thousands of Dollars Does it Cost? 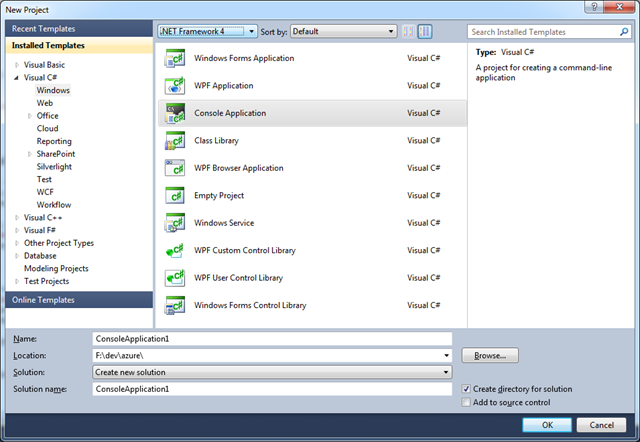 For .NET / Visual Studio developers, download the SDK as part of the Windows Azure Tools for Microsoft Visual Studio. Or, better still, follow these instructions from David Aiken for getting started with Windows Azure. For non-.NET, non-Visual Studio developers, download the Windows Azure SDK separately. And even though the Azure SDK makes Azure development super über ultra convenient on .NET, it does not cost any money. A freebie. If you are developing on a non-.NET platform, there is very likely an open source client library for you. Microsoft provides a library now for PHP, too. Can You Give Me a Short Example? Sure, here is a code snippet showing the two primary classes in action (and bold blue). Under the hood, there are REST calls being made out to the Blob storage services, but you don’t need to deal with this plumbing in your code. Are these Calls Really REST Under the Hood!!?? They sure are. You can prove this by firing up an http sniffer like Fiddler. You will see http traffic whiz back and forth. What causes “specified container does not exist” error message in Windows Azure Storage? For other errors or issues, try the Azure Support Forum. Is it Production Quality Code? Hmmm… We have a continuous stream of code on a single (long) page, in a single source file… Is it “Production Quality Code” you might wonder? I’m going to go with “no” – this code is not production ready. It is for getting up to speed quickly and learning about Azure Blob Storage. Can I Tell if My Blobs Get to the Cloud? 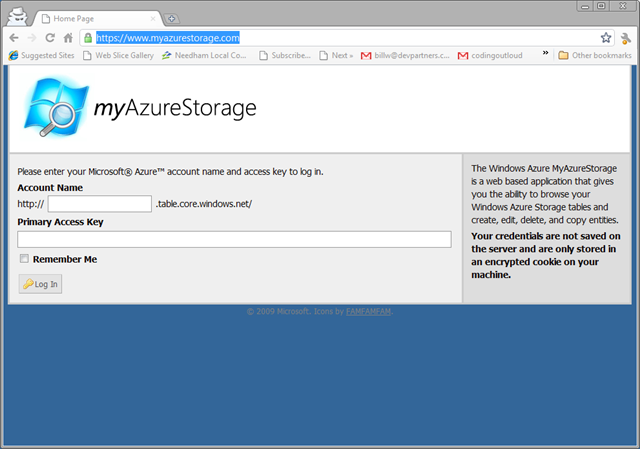 Now you need to know something about how your Azure Storage account was configured in the Cloud. You need to know both the Account Name and one of the Access Key values (Primary or Secondary – it doesn’t matter which). Note: the Access Key above is no longer valid. Use a different real one if you like, or see the One Page of Code snippet below for how to do this using local storage in the Dev Fabric. What Project Template Should I Use in Visual Studio? Okay, the working code – fully functional – on One Page of Code – appears below. After you create a new Visual C# Console application in Visual Studio 2010, as shown above, simply clobber the contents of the file Program.cs with the code below. That oughta be easy. Then start playing with it. You will also need to add a reference to Microsoft.WindowsAzure.StorageClient – but first you’ll need to switch away from the .NET Framework Client Profile. 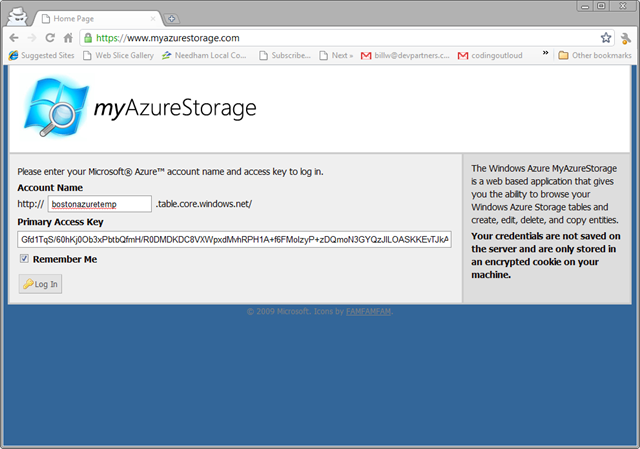 Also note that the following code will post to Azure Blob Storage in such a way that the item stored will be accessible from a web browser. This is not the default behaviour; read the code to see the couple of lines that influence this. Note that this code is intensionally compressed to fit in a short space and all in one place – this is not intended to be production code, but “here is a simple example” code. For instance, this code does not use config files – but you should. This is just to help you quickly understand the flow and take all the magic out of getting a code sample to work. You can also download this code directly: SnippetUploaderInOnePageOfCode.cs. This entry was posted in One Page of Code, Programming on September 23, 2010 by Bill Wilder. Uhhhh, yes it does! After calling GetContainerReference, container.CreateIfNotExist() was called to ensure the container was there. No errors were thrown. What could be the problem? Some storage systems are “eventually consistent” – a technique used in distributed scalable systems in which a trade-off is made: we open a small window of inconsistency with our data, in exchange for scalability improvements. One example system is Amazon’s S3 storage offering. So there should be no problem, right? Well, not exactly. Is Azure Storage actually Eventually Strongly Consistent? Okay, “Eventually Strongly Consistent” isn’t a real term, but it does seem to fit this scenario. I’ve heard more than once (can’t find authoritative sources right now!??) that you need to give the storage system time to clean up after you delete something – such as a Blob container – which is immediately not available (strongly consistent) but is cleaned up as a background job, with a garbage collection-like feel to it. There seems to be a small problem: until the background or async cleanup of the “deleted” data is complete, the name is not really available for reuse. This appears to be what was causing my problem. Another dimension of the problem was that there was no error from the code that purportedly ensured the container was there waiting for me. At least this part seems to be a bug: it seems a little eventually consistent is leaking into Azure Storage’s tidy instantly/strongly consistent model. I don’t know what the Azure Storage team will do to address this, if anything, but at least understanding it helps suggest solutions. One work-around would be to just wait it out – eventually the name will be available again. Another is to use different names instead of reusing names from objects recently deleted. I see other folks have encountered the same issue, also without a complete solution. This entry was posted in Azure, Cloud Computing, Programming on September 15, 2010 by Bill Wilder. I presented a talk on Building Cloud-Native Applications using Microsoft Windows Azure. My slides are available as a PPT download and on slideshare.net. <aside>Maura and I went to Vermont a day early. 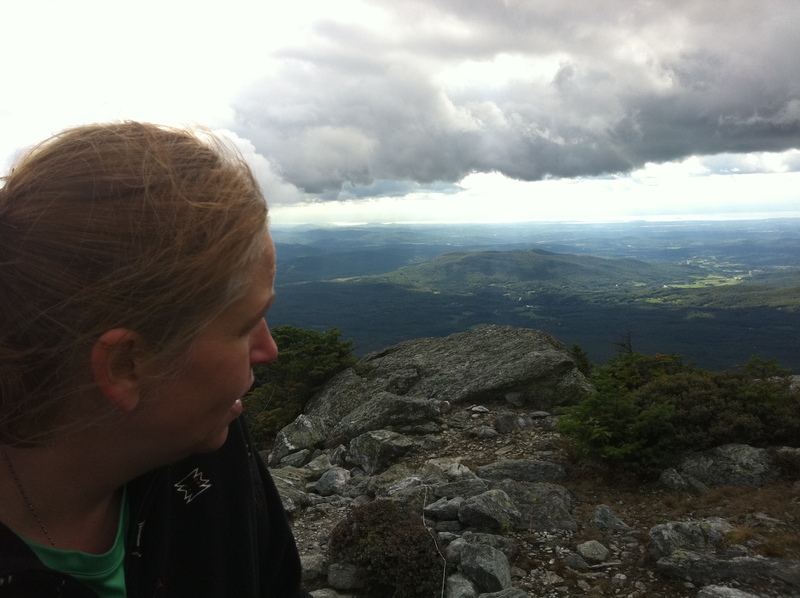 We put that time to good use climbing to the summit of Vermont’s highest mountain: Mt. Mansfield. We hiked up from Underhill State Park, up the Maple Ridge Trail, over to the Long Trail, up to the summit, then down the Sunset Ridge Trail (map). 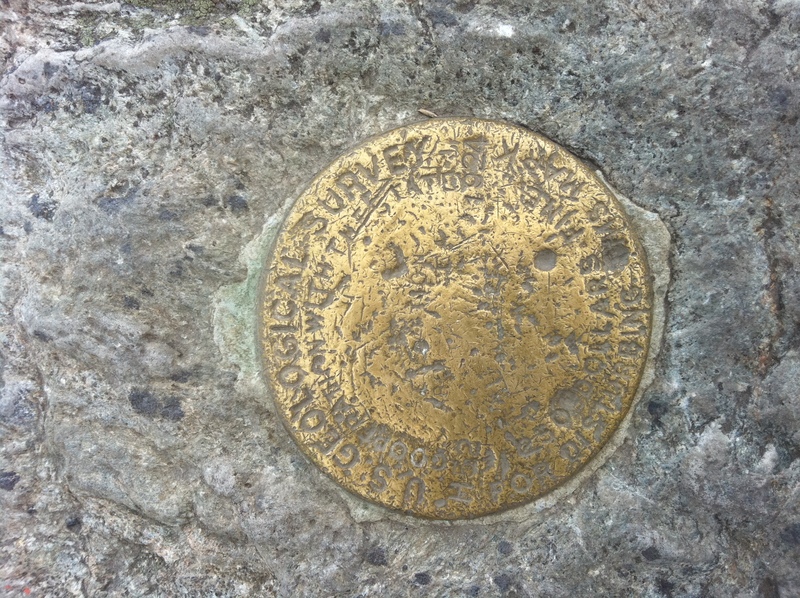 It was a really tough climb, but totally worth it. I think the round trip was around 7 miles. This entry was posted in Azure, Bill gave a talk, Cloud Computing, Programming and tagged azure, cloud, vtcc2 on September 12, 2010 by Bill Wilder. I gave a talk at the Thurs Sept 2, 2010 New England VB.NET user group meeting. Andy Novick covered SQL Azure, and I covered the rest (Blobs, Tables, Queues, Drives, and CDN). My slides can be downloaded here (which is hosted on Azure Blob storage!). First up is Building Cloud-Native Applications with Windows Azure – at the Vermont Code Camp on Saturday, September 11, 2010.
prepared to move to the cloud in the future. This entry was posted in Azure, Bill gave a talk on September 9, 2010 by Bill Wilder.